seen all its wonders, when every star was in sight. And I’ve traveled the world, from one side to the other. I’ve seen this great Earth, and she’s truly our mother. Yes I’ve set sail on the oceans, through calm seas and storm. And when it all cleared made it to Islands perfectly warm. The places it’s coldest, yes I’ve been to those too. I’ve seen the most amazing animals, but not at the zoo. All those wonders of the world? I traveled far to see them all. And yet after all this, my heart still remained small. The years went by, and I returned back home. I found my true love, and she wasn’t in Paris or Rome. But when I saw her that day, my life changed its whole plan. This time we left together, no longer in search of love’s view. You had found that in me, and I had found it in you. 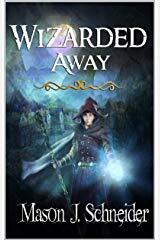 Next Post Get My Book Wizarded Away 🧙‍♂️ For Free On Kindle!